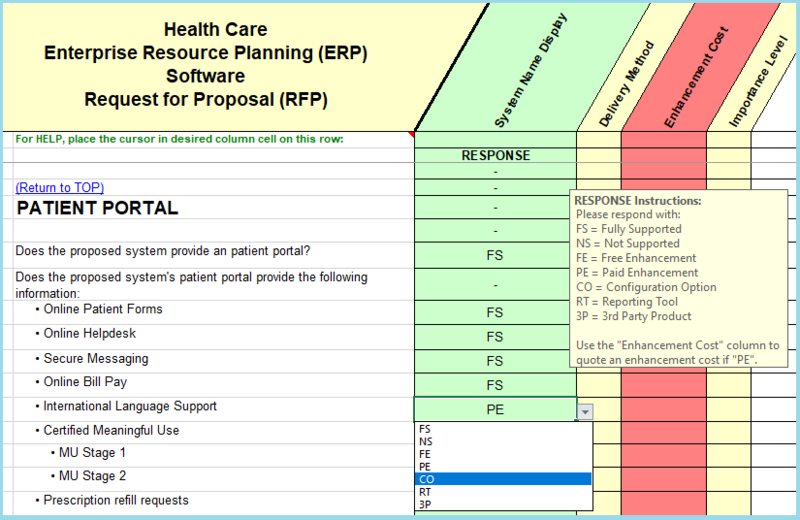 Software Selection Home > RFP Template List > Healthcare Enterprise Resource Planning Software Selection Price and Buy Button is near the bottom of page. The most reliable way to identify user needs, determine software requirements, prepare an RFP, evaluate proposals, hold demonstrations, and select healthcare enterprise resource planning software! Save Time - These templates for selecting healthcare enterprise resource planning software are pre-loaded with more than 5,000 professionally researched and written selection criteria. This eliminates the need to spend weeks of time identifying requirements from scratch. All criteria are in quantitative format designed specifically for choosing hospital ERP software systems. Save Effort - Easily understood, full sentence hospital ERP requirements and online help eliminate time wasted answering vendor questions. Full vendor input validation eliminates wasted time spent to clarify, or even worse, manually review thousands of vendor replies. Allow your staff to focus on their core job responsibilities. Save Money - The templates listed below will reduce time and effort required, resulting in better, more effective software selection decision making information at less cost. Eliminate or reduce overtime, eliminate expensive do-overs caused by overlooked requirements. 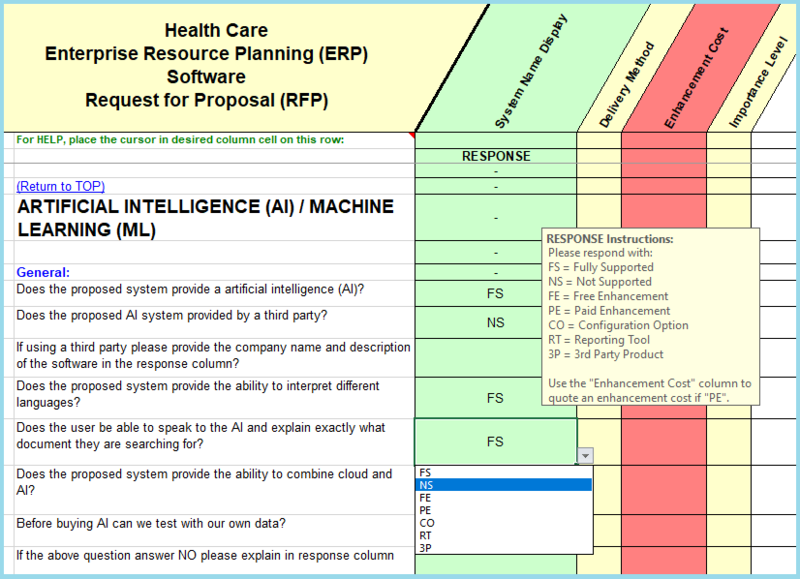 Healthcare Enterprise Resource Planning (ERP) Requirements Template Toolkit - If you need to identify hospital ERP user needs and software requirements this is perfect. This collection of templates enables accurate identification & prioritization of all time collection and attendance functions, workforce management, workflow, compliance, and software requirements. Optimize system planning for success! Buy each template below individually or Buy All Requirements Toolkit Templates Bundled & Save! Request for Proposal (RFP) Template Toolkit - Do you need to send an RFP to vendors and evaluate vendor RFP responses (proposals)? This extensive collection of templates enables you to quickly prepare a detailed RFP, obtain vendor proposals that consistently address all industry standard criteria, including those for leveraging best practices to your firm's advantage, and then efficiently evaluate and compare each vendor response. Software Proposal Evaluation, Comparison, & Selection Template Toolkit - Have you already sent an RFP to vendors, and now need to quickly evaluate and compare those proposals? This collection of templates enables you to analyze and compare competing vendor proposals at all levels - suitability, usability, supportability, and financial. A very useful software selection toolkit. Buy these templates individually or Buy All Evaluation Toolkit Templates Bundled & Save! Vendor Healthcare Enterprise Resource Planning Software Demonstration/Presentation Script Template Toolkit enable viewing how proposed software performs in critical operating scenarios. This improves the accuracy of all decisions needed when selecting the best hospital ERP software. Buy each template separately or Buy All Demonstration Toolkit Templates Bundled & Save! Implementation Checklist Template Toolkit enable proper scheduling of healthcare enterprise resource planning software implementation tasks and events. This ensures a smooth implementation with no false starts. Buy any template separately or Purchase ALL Implementation Toolkit Templates Bundled & Save! 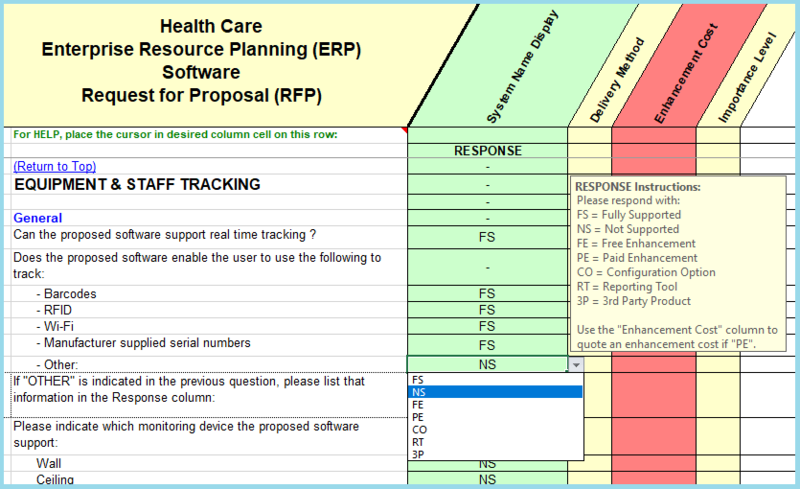 Actual screens and questions from this RFP template are shown below to illustrate how it enables you to easily collect the unique metrics needed to successfully identify, select, acquire, and implement the healthcare enterprise resource planning software (ERP) solution best suited to your organization's needs. SAVE WEEKS, even MONTHS OF TIME by using over 5,000 feature criteria to quickly and accurately identify your exact needs, then simply delete the rest to easily create an unbiased healthcare enterprise resource planning RFP that best communicates your specific requirements to vendors! Use this Excel-based, universally understood, and highly customizable template. In addition, a detailed Feature to Cost Traceability function helps assure a smoother system inplementation and maximum ROI. View typical RFP Table of Contents. IDENTIFY FEATURE AVAILABILITY & DELIVERABILITY. Unlike other healthcare enterprise resource planning software RFPs, Infotivity RFP Masters template automatically collect the information needed to identify BOTH the AVAILABILITY of software features, and their DELIVERABILITY, i.e., HOW those features will be delivered. Each Healthcare Enterprise Resource Planning RFP Master includes a Feature Support Matrix (FSM) to automatically capture this information, which can be used to create very accurate and reliable healthcare enterprise resource planning software system implementation schedules. View samples here. Determine RISK and SUPPORTABILITY. Healthcare Enterprise Resource Planning Software RFP Masters automatically evaluate vendor response data collected to quantitatively determine the SUPPORTABILITY INDEX of each proposed software system. 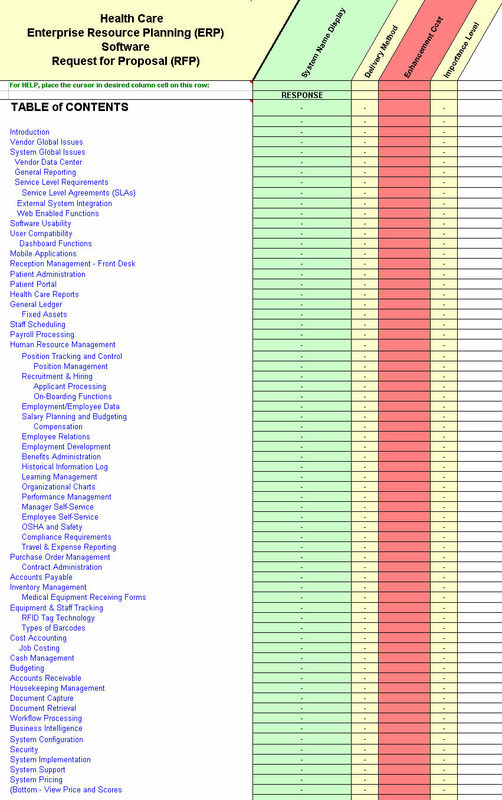 This index ranks the potential support problems inherent in each proposal. Accurately compare the amount of ongoing support needed to keep each proposed Healthcare Enterprise Resource Planning management (ERP) software system up and running. Measure the true impact of each system on your business over the long term. View sample here. 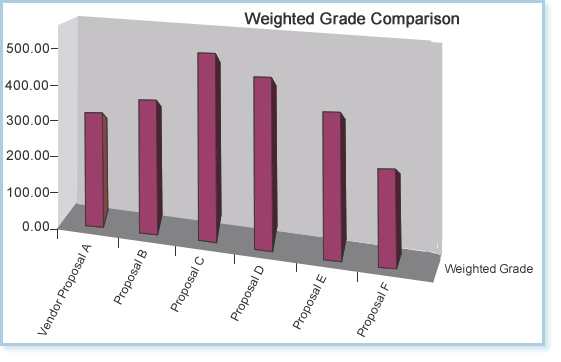 Highly flexible weighted grade score based on user-defined weights down to the detail row and response level is calculated for each RFP question criteria. This user-defined, customizable weighting allows vendor RFP responses to be evaluated based on your company's specific needs priorities. Calculate weighted scores by department, by workflow process, by application, or by activity to calculate a score that reflect the true value and impact of a proposed hospital ERP software system. WORKFLOW TOPICS ensure the proposed hospital ERP software for management can be fully integrated and utilized to enhance business procedures at all levels of the enterprise. View Workflow samples here. VENDOR RESPONSE VALIDATION saves time and effort, and reduces errors, when evaluating vendor Healthcare Enterprise Resource Planning software proposals. View example here. EASILY CUSTOMIZED to meet your unique Healthcare Enterprise Resource Planning system needs, using basic Excel techniques. All Vendor Response Evaluation & Comparison tools listed below are INCLUDED with this Healthcare Enterprise Resource Planning software RFP. Evaluate Proposed Software Based on Suitability, Quality, Supportability, and Financial Impact. "APPLES-to-APPLES" ERP FEATURE COMPARISON of vendor RFP responses (proposals) is assured by extensive use of quantitative RFP questions and full vendor response validation. Compare proposed Healthcare Enterprise Resource Planning system software features side-by-side faster and more accurately with the fully automated Color Comparison Chart matrix included with this RFP at no extra charge. View a typical comparison here. "Healthcare Enterprise Resource Planning Response Evaluation Ratios (scores) indicate how a vendor is planning to provide the proposed solution, e.g. the pros and cons of a vendor proposal from a practical "is it doable?" perspective. See HOW a vendor is planning to address each of your requirements, and just how reliable it really is.. View a typical evaluation ratios here. AUTOMATED WEIGHTED GRADE POINT SCORING is a quantitative measure of how well a proposed Healthcare Enterprise Resource Planning system matches up to your business priorities. This graph compares the overall total scores for each proposed hospital ERP system. This Score is based on all Healthcare Enterprise Resource Planning vendor responses except Pricing and Vendor Background. View sample 3-D Bar Chart comparison here. 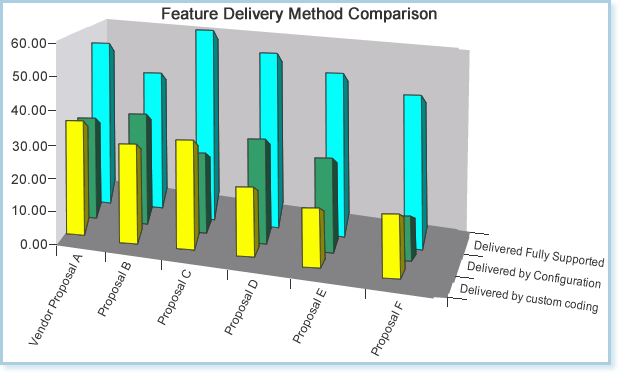 Feature Delivery Methods This graph compares HOW each Healthcare Enterprise Resource Planning vendor is planning to deliver the proposed hospital ERP system. The bars show how much of each competing system is going to be delivered Fully Supported "out-of-the-box", how much will be delivered using the Report Writer, a Configuration option or 3rd Party product, and how much is dependant on Custom Programming & Scripting. 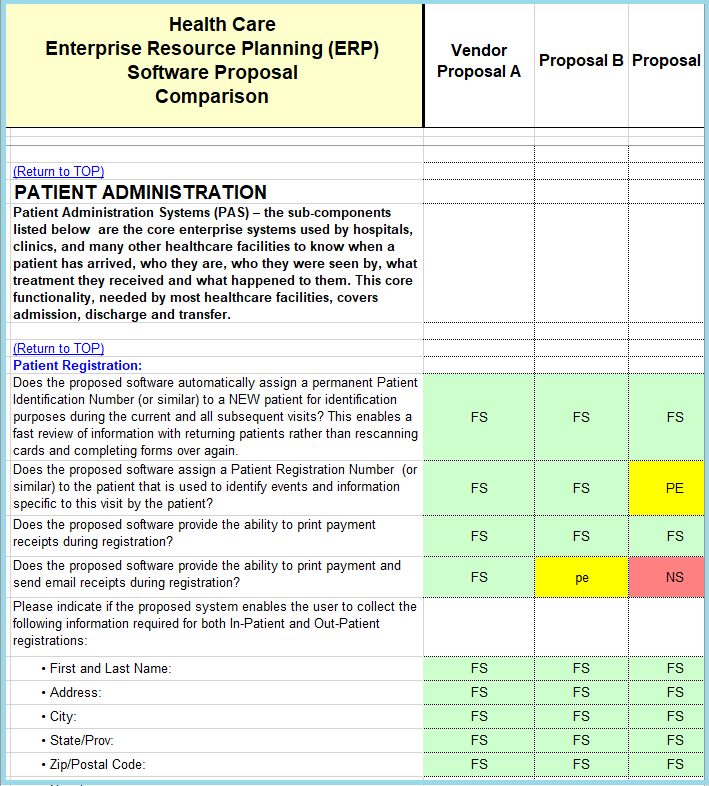 The scores used in this Healthcare Enterprise Resource Planning comparison are based on responses to Healthcare Enterprise Resource Planning system questions only, i.e., no vendor, pricing, or support responses are utilized. View sample 3-D Bar Chart comparison here. Supportability Index A proposed hospital ERP system could look very good on paper, but once implementation begins the reality could be very different. The ease with which a Healthcare Enterprise Resource Planning system can be implemented and maintained over it's expected life is controlled in large part by the amount of custom programming and scripting required to build & maintain the system. The Supportability Index is based on responses to Healthcare Enterprise Resource Planning Software System Features only. This graph compares the potential support effort inherent in each proposed healthcare enterprise resource planning (ERP) software system. View sample 3-D Bar Chart comparison here. 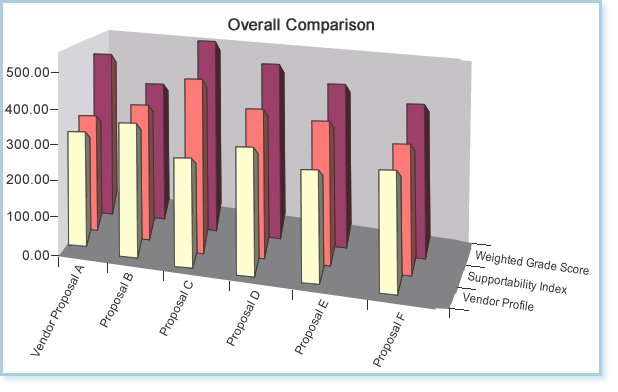 Overall Comparison This graph compares the total Weighted Score of each proposed healthcare enterprise resource planning system along with its Supportability Index and associated Vendor Profile. Use this when assessing the RISK of a proposed healthcare enterprise resource planning system and whether or not the hospital ERP system can indeed be implemented by the proposing healthcare enterprise resource planning vendor successfully. View sample 3-D Bar Chart comparison here. 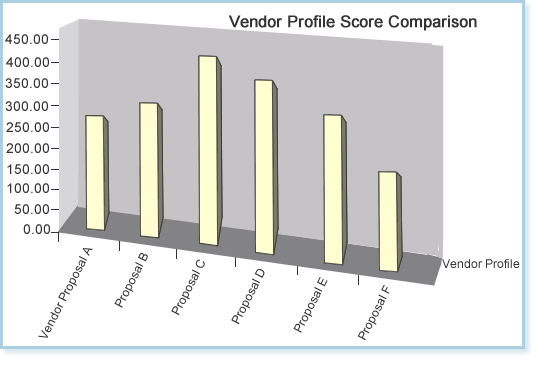 Vendor Profile Scores This graph compares a score measuring the background, expertise, capabilities, and other data collected in the Vendor Global Issues section of the healthcare enterprise resource planning RFP. The Vendor Profile Score provides a way of assessing the Capabilities PROFILE of a proposing healthcare enterprise resource planning vendor. View sample 3-D Bar Chart comparison here. COVER LETTER SAMPLES - Make the task easier with this healthcare enterprise resource planning management RFP cover letter template collection. Choose from Letter samples designed for all events, such as "RFP Response Request", "Intent to Respond", "No Intent to Respond", "RFP Change Enclosed", "Proposal Rejection" "Finalist Selection", and " Best & Final Offer Request" to meet your unique healthcare enterprise resource planning system needs. FULL VERSION of the RISK ASSESSMENT MATRIX CHECKLIST focused on healthcare enterprise resource planning system acquisition and implementation projects for working sample "Click Here"
BPR / BPE / WORKFLOW Processing Checklists - Excel-based template for mapping the current "AS-IS" state of an existing healthcare enterprise resource planning business process down to the data element level, a time-saving organizer when developing the new "TO-BE" state, or when trying to determine what is required to implement a new process, or when preparing for data conversion. MS Word DOCUMENTATION describing the organization and usage of the healthcare enterprise resource planning RFP and Evaluation/Comparison matrices. Thousand plus of pre-defined healthcare enterprise resource planning RFP criteria ensure no important business requirements or software features "slip through the cracks". All are in a quantitative format that guarantees vendor responses will be meaningful, consistent, and easy to compare. All questions are professionally prepared by application specialists to address BOTH the STANDARD features and EXCEPTION CASE software functions required. Precisely identify, collect, & prioritize all healthcare enterprise resource planning functional and process deficiencies between the software system currently in use and client/company current or projected needs. Easily document the severity, category, and requirements type of missing functionality using GAP analysis, and then calculates a score, for each GAP. The GAP process creates a prioritized, detailed list of hospital ERP software requirements useful in all later phases of the healthcare enterprise resource planning software evaluation/selection process, i.e., in RFP creation, Software Demonstrations, Price (BAFO) negotiation, and software system implementation. View details at Fit/GAP Analysis Details. Unlike other RFP templates that try (and fail) to gather useful solutions data about complex healthcare enterprise resource planning system features, RFP Masters are not constrained to the use of summary-level "Yes" or "No" answers. This RFP Master uses a Feature Support Matrix (FSM) that identify BOTH feature AVAILABILITY and DELIVERY Method. This Healthcare ERP RFP Master function is useful during both the healthcare enterprise resource planning software selection AND the system implementation phases of large projects because it enables effective Earned Value Management through detailed cross-referencing of usable hospital ERP software functionality and vendor invoicing. Unlike other RFP templates, an time and management software RFP Master template can illustrate potential support problems (and risk) inherent in vendor software proposals. The Feature Support Matrix (FSM) used in each RFP Master categorizes the inherent risk posed for each criteria, and uses that information to calculate the SUPPORTABILITY INDEX for each vendor RFP response. For example, a feature delivered "out of the box" FULLY SUPPORTED is less risky than one delivered through custom programming, even if the programming is free. This RFP Master function is useful during both the software selection AND the implementation phases of a large hospital ERP system because it enables effective Earned Value Management through detailed cross-referencing of usable software functionality and vendor invoicing. This hospital ERP RFP template provides an "Enhancement Cost" column for cross-referencing vendor invoices with the estimated cost of each custom custom script and/or source code modification proposed by the vendor. This makes the healthcare enterprise resource planning RFP an ideal tool for managing vendor invoices effectively. The uses of this are many: preventing payments to vendors from exceeding usable system progress, preventing vendor over-billing, and prevents proposed tasks from being omitted, and as an implementation audit tool. The ability of the proposed hospital ERP software to successfully integrate with existing business process workflows, or implement new workflows, is critical to a achieving the high productivity increases and ROI expected of the new hospital ERP system. This software RFP Master examines all pertinent Workflow features in detail. Vendors must answer each RFP question by choosing from a pre-defined list of possible responses. See below for an example of this drop-down list. This forces all vendors to respond to each healthcare enterprise resource planning (ERP) software question in a consistent, standard manner. Eliminates the days of time typically wasted trying to compare the inconsistent or incomplete vendor responses obtained by using traditional, non-quantitative RFP questions! Ensures vendor proposals are easy to compare and evaluate! These comparison matrices automatically change vendor response cell background color to GREEN, YELLOW, or RED, to reflect how favorable each response is to your needs! Compared to the tedious task of reviewing hundreds of mono-color Yes/No answers, these colored responses allow problem areas to be spotted more easily, and risk assessment is made much more accurate. All required response comparison matrices are included and ready-to-use! Quickly and easily compare healthcare enterprise resource planning software system proposals side-by-side, feature by feature, in detailed comparisons you control! Keep your project on-schedule and under-budget. Use an extensive set of ratio calculations to compare healthcare enterprise resource planning vendor proposals quickly and efficiently. Compares the Weighted Grade Point Score calculated for each proposed hospital ERP system. This is calculated as follows: The healthcare enterprise resource planning vendor response to each RFP question is assigned an unweighted "raw" score. This raw score is then multiplied by the weight factor you entered previously (default = 1) for that healthcare enterprise resource planning software RFP question to calculate the weighted score for each response. All of these individual scores are then totaled for use in this comparison. This score is essentially a measure of how well a healthcare enterprise resource planning software system fits your business and software needs, prioritized by the weight (importance level) you assigned to each question in the RFP. In essence, this score measures the SUITABILITY of each proposed hospital ERP software system to your overall requirements. . NOTE this score measures just software functionality, and does not include any measure of vendor background, expertise, support, or programming ability. 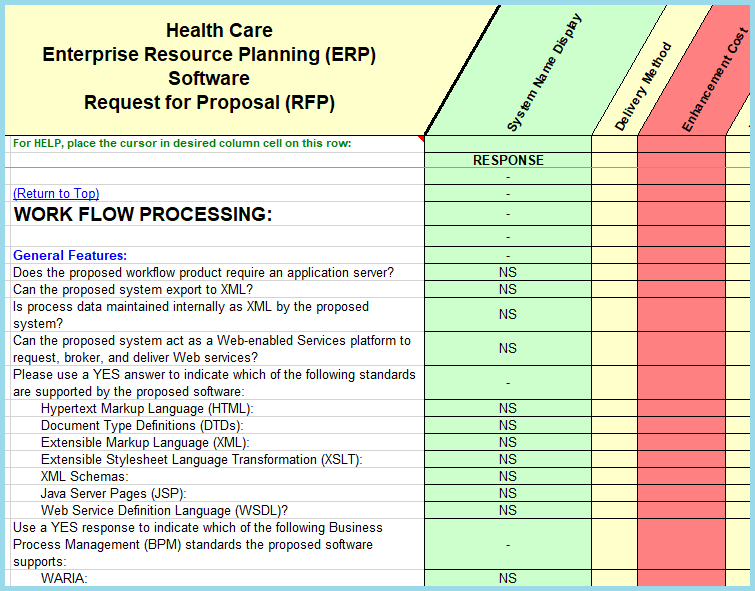 An analysis of how each healthcare enterprise resource planning vendor is proposing to deliver the system feature/function contained in their healthcare enterprise resource planning proposal. The graph below shows the percentage that is Fully Supported "out-of-the-box", the percentage to be done via Report Writer, a Configuration Parameter, or Third-Party add-in, versus the percentage to be done via Custom Coding (Scripting / Programming). This information is very useful in terms of identifying RISK, since a Fully Supported (and tested) healthcare enterprise resource planning feature presents far less risk than that same healthcare enterprise resource planning feature done as a "custom programming" task. Also, see the Supportability Index, which sums up these detail risk factors. The Supportability Index is a forecast of how much healthcare enterprise resource planning software support and maintenance may be required to keep each proposed software system running at full potential over it's lifetime. This score is determined by how much custom coding is required to implement the proposed healthcare enterprise resource planning software, and which business processes depend on the customized software. 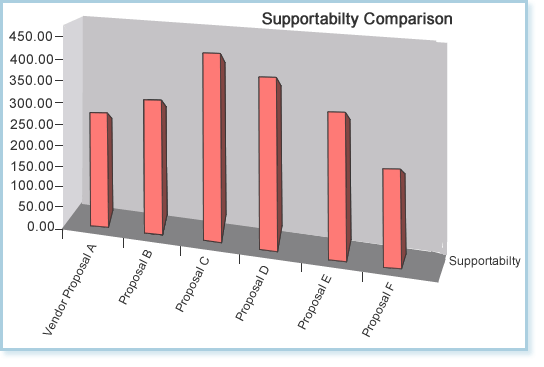 This graph compares both the Weighted Grade (Suitability) Score, Supportability Index, and the Vendor Capabilities Profile side-by-side for easy reference. It is important to see how much custom coding is in a proposed healthcare enterprise resource planning system that also has a high Weighted Score, along with the Vendor Profile. The more custom code, the higher the risk posed by that healthcare enterprise resource planning system. Therefore, the more custom coding, the more expertise and capabilities a vendor should have. The backgrounds, expertise, capabilities, and certifications of each vendor is obtained in the Vendor Global Issues section of the healthcare enterprise resource planning RFP. The hospital ERP vendor responses to this section are totaled separately from the software functionality topics, and this data is used to calculate the "Vendor Profile Score". The higher the score, the more CAPABILITIES a vendor is probably going to be. Purchase and download your choice of healthcare enterprise resource planning software selection toolkits by clicking the "Add to Cart" button below to use our online order form and Secure Checkout. HEALTHCARE ERP SOFTWARE REQUEST for PROPOSAL (RFP) TEMPLATE and RESPONSE EVALUATION TOOLKIT BUNDLE - Purchase and download just the Healthcare Enterprise Resource Planning Management Software RFP and matching Vendor Response Evaluation Matrix toolkits. 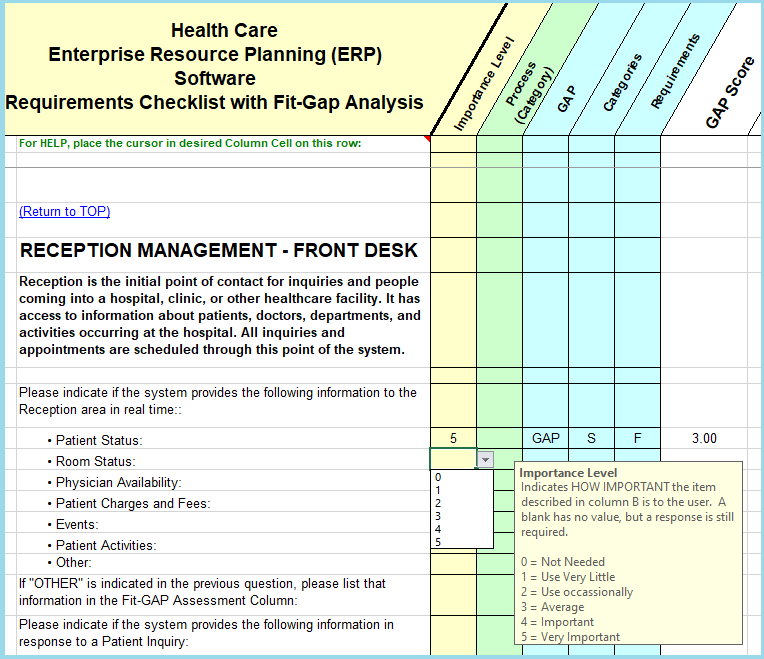 HEALTHCARE ERP REQUIREMENTS CHECKLIST w/GAP-Fit ANALYSIS TEMPLATE TOOLKIT ONLY - The most effective way to identify and prioritize system requirements. This checklist contains over 4,000 healthcare enterprise resource planning administration/management/operational functions and processes designed for gathering end user needs, determining the cause of those needs, then prioritizing their resolution and/or mitigation. Covers all aspects of industry standard healthcare enterprise resource planning software applications. 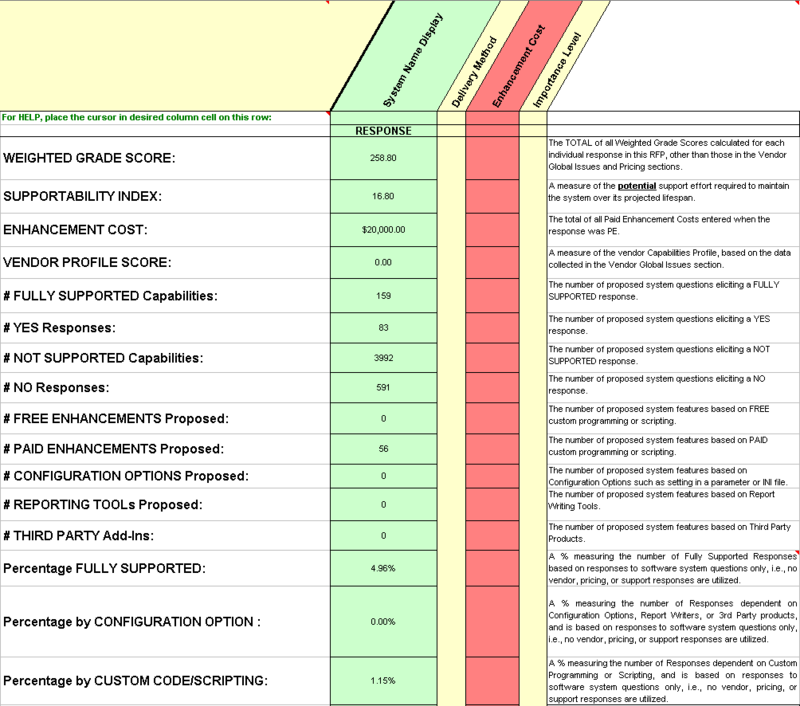 HEALTHCARE ERP PROPOSAL EVALUATION TEMPLATE TOOLKIT - Download just the vendor Proposal) Evaluation Matrix templates ONLY. These templates are set to accept your exisiting selection criteria. Ideal if you have already issued an RFP and now need to evaluate and compare vendor RFP responses (proposals). 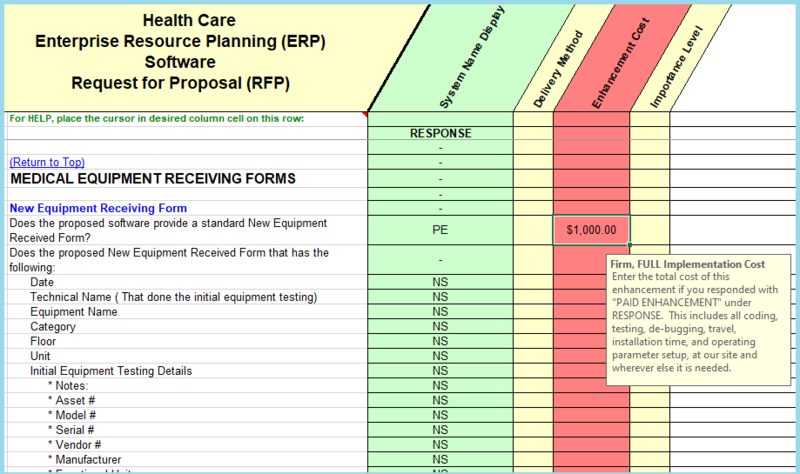 HEALTHCARE ENTERPIRSE RESOURCE PLANNING DEMONSTRATION SCRIPT TEMPLATE TOOLKIT ONLY - A very detailed script with hundreds of hospital ERP software demonstration tasks that enables any number of staff members to assess all or part of a vendor hospital ERP software demonstration. HEALTHCARE ERP SOFTWARE IMPLEMENTATION TEMPLATE TOOLKIT ONLY - Already selected hospital ERP? If so, these templates will help streamline each step of the hospital ERP software implementation process. ALL the tools & features described above, i.e., everything needed to accurately identify project management user needs, quickly determine PM system requirements, prepare and distribute a project management RFP, compare & evaluate vendor RFP responses (proposals), and select the best project management (PM) software system for your organization's needs, are included in or with each RFP Template!